Caleb Frankel, VMD, is an internship-trained veterinarian and self-trained technologist. He currently divides his time between 2 roles: director of new product development at Brief Media and emergency medicine practitioner at Veterinary Specialty and Emergency Center in greater Philadelphia, Pennsylvania. He is also the founder of a new venture, Instinct Science, and the blog VMD Technology, 2 projects devoted to helping veterinary teams leverage technology. RESUMES MAY NEVER GET PRINTED IN THIS DIGITAL WORLD, SO KNOW HOW TO FORMAT A RESUME THAT LOOKS PROFESSIONAL AND ATTRACTIVE ON ANY SCREEN. Hiring advice used to focus disproportionately on trendy resume rules taught by well-meaning high school guidance counselors: Keep it to 2 pages, include a wordy objective, never abbreviate, do not use fragments, never list a GPA, and state that references are available upon request. This article is not that. Here's the thing—the average employer looks at a resume for less than 10 seconds.1 That's it. And with the availability of Google searches, social media, personal blogs, and LinkedIn profiles, that timeline is arguably shrinking. It's time to rethink the resume and the broader objective of getting hired. The following tips, while not gospel, can lead to hiring success. In Search of Job-Seeking Success? At least, do not write it yet. The first step in building a resume is getting a job-seeker's personal brand optimized. This isn't Ryan Seacrest branding either—we're talking self-marketing basics. First, set up a professional email address. For example, [email protected] is free and appropriate. Set Facebook, Instagram, and Twitter accounts to private so only followers can see posts, photos, and videos. Keep in mind that although discrimination concerns may make hiring managers hesitant to become followers on social media, employers are known to leverage mutual friends to spy on digital behavior. If a questionable digital trail exists, clean it up or take it down. Next, Google your name, and address any concerning results. Take control by setting up professional social media accounts showcasing skills, passion, and work, which will eventually enter Google's search results and push professionally unappealing results lower. Finally, get on LinkedIn. Like it or not, it's valuable. It's also easy and free, and it effortlessly connects job-seekers to recruiters and provides the best professional Google search result. Don't overdo it. LinkedIn should act simply as a resume summary that includes a professional profile overview, previous work, education, contact information, and a professional photograph. The most powerful way to improve the resume actually happens before it's shared. Remember the Kevin Bacon game?2 In the small world of veterinary medicine, the chances of being connected to someone at the hiring practice or organization are high. Take some time to research mutual contacts. Look at historical or current clients or team members. What about overlap from college contacts? Once a networking opportunity emerges, connect and request a recommendation. LinkedIn, by nature, can be particularly helpful. When it comes time to write the resume, there are 3 keys: no rules, design matters, and personalize a version for each job. With the foundation set for success, it's time to write. There are 3 keys: no rules, design matters, and personalize a version for each job. Stand in the hiring manager's shoes when writing and designing a resume to ensure your language and creativity stand out. Finally, customize the resume specifically for each practice and position. Don't include irrelevant sections. Keep a document that holds sections cut from previous resumes for future reference. Anecdotally, owners of practices of the future—the prolific new millennial owners, in particular—are looking for modern skill sets (eg, interests in technology and social media). Highlight those skills and passions. Leverage the fact that most resumes now are sent or uploaded electronically and link to professional social accounts or include a video introduction. Also, remember that the resume may never get printed in this digital world, so send it in an easy-to-read format that maintains its beautiful design on any screen (eg, PDF). Many proclaim the cover letter is dead,3 but in the author's experience, they still provide value, even if written in the body of the email to the hiring manager. A cover letter can succinctly showcase communication skills and tell a personal story better than a resume. Again, customize and personally address the letter for each company or practice. Only 20% of this article about resumes was spent on the actual resume—the best possible metaphor for hiring in this digital age. Adams S. What your resume is up against. Forbes. http://www.forbes.com/sites/susanadams/2012/03/26/what-your-resume-is-up-against/#2ee56b8175a8. Published March 2012. Accessed February 2016. Six degrees of Kevin Bacon. Wikipedia. https://en.wikipedia.org/wiki/Six_Degrees_of_Kevin_Bacon. Accessed February 2016. Vozza S. Cover letters are dead: do this instead. Fast Company. http://www.fastcompany.com/3056444/the-future-of-work/cover-letters-are-dead-do-this-instead. Published February 2016. Accessed February 2016. Handley A. Everybody Writes: Your Go-To Guide to Creating Ridiculously Good Content. Hoboken, NJ; John Wiley & Sons; 2014. 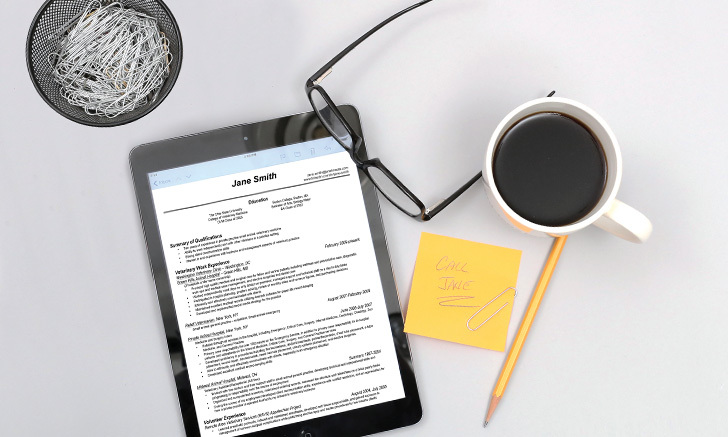 Zhang L. 4 better ways to lay out your resume, depending on your next career move. themuse.https://www.themuse.com/advice/4-better-ways-to-organize-your-resume-depending-on-who-you-are-and-where-youre-going. When looking to hire potential future leaders for your practice, look for those with modern skill sets (eg, interests in technology and social media). Veterinary medicine is a small world with high chances for mutual contacts, so take advantage of networking opportunities for recommendations about potential hires. Most hiring managers spend 10 seconds reading a resume, so catch his or her attention by ensuring your special skills, personality, dedication, and creativity stand out. Be sure to customize your rsum for the specific practice and the specific position you are seeking within the practice.